General Hospital Spoilers: Missing Baby Mystery Revealed – Where Is Maxie’s Newborn Son? 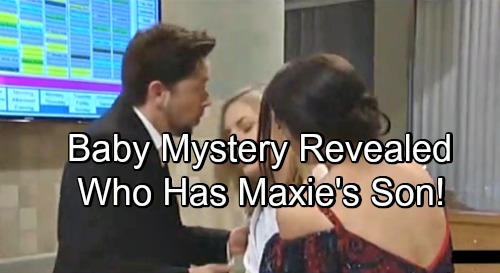 General Hospital (GH) spoilers tease that major baby drama’s headed Maxie’s way. She’ll be terrified when she realizes her newborn son has vanished. Maxie will gather up what little strength she has left to drag herself into the hallway. She’ll call out to anyone who might know where her baby is, but she won’t get very far. Spinelli (Bradford Anderson) and Sam (Kelly Monaco) will catch Maxie after she suddenly collapses at GH. They won’t know what’s going on, but Maxie’s health will be their priority. General Hospital spoilers say they’ll make sure Maxie returns to her room immediately. Once Maxie’s resting, Sam and Spin can solve the missing baby mystery. Where has the little fella gone? Is this a dire situation or simply a misunderstanding? Let’s consider our options. It’s possible that the baby’s been kidnapped, which would be a total nightmare for Maxie. If someone like a secretly alive Faison (Anders Hove) stole the kid, that’d be a pretty awful scenario. There’s also a chance this involves some surrogacy funny business. Brad (Parry Shen) and Lucas (Ryan Carnes) are ready to adopt a child from an anonymous birth mom. Could Nelle (Chloe Lanier) have made the deal and planned to hand over her own kid? She might’ve hoped to bond with Michael (Chad Duell) over the loss. If she changed her mind, Maxie’s baby could be stolen to hand over instead. Next, we should think about a potential crisis for the tot. Maxie will probably notice that her son’s no longer on the baby cam. If his health took a hit, the doctors could be frantically trying to save him. That’d be another terrible ordeal for Maxie. She couldn’t bear the thought of losing someone else she loves. This baby is her last piece of Nathan (Ryan Paevey), so let’s hope the kid’s OK.
Of course, the best possible outcome is that Maxie’s worried over nothing. The baby’s in the NICU, so he’ll have to be monitored closely. There should be nurses looking after him and doing routine tests throughout the night. Perhaps a staff member picked the baby up for something completely normal. Do you think Maxie’s child will be kidnapped or just out of Maxie’s sight for a moment? Could this little one endure a crisis or will he just need the usual NICU care? General Hospital spoilers say Maxie will be eager to get some updates. We’ll keep you posted as other GH news comes in. Stay tuned to the ABC soap and don’t forget to check CDL often for the latest General Hospital spoilers, updates and news. General Hospital Spoilers: Sam Sets Drew Up for More Heartache With Jason – Is Sam Worthy of Drew’s Deep Devotion?